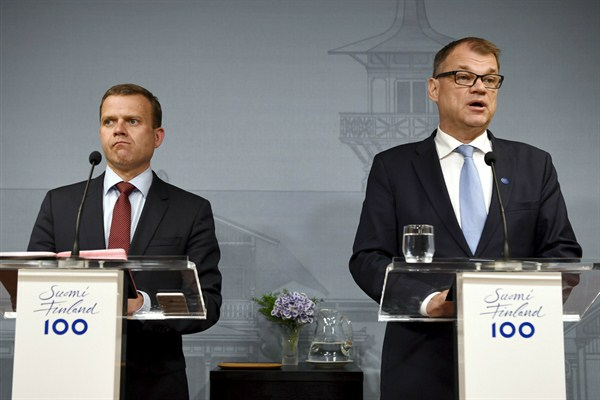 Finnish Prime Minister Juha Sipila, right, and Minister of Finance Petteri Orpo attend a press conference, Helsinki, Finland, June 12, 2017 (Lehtikuva photo by Jussi Nukari via AP). Finland is currently conducting a trial to measure the effects of Universal Basic Income (UBI), though the project has been criticized by some as poorly designed. Writing in the New York Times last week, Antti Jauhiainen and Joona-Hermanni Makinen said the sample size was “too small to be scientifically viable.” In an email interview, Heikki Hiilamo, a professor of social policy at the University of Helsinki, describes the concepts underpinning UBI, how Finns are responding to the trial and what it is intended to measure.